I've been wanting to try a chai latte for ages now. I've seen them advertised when I buy my Cappuccinos in Starbucks and various other coffee shops. It's that combination of spices, including cinnamon and cardamom with creamy frothy milk that always sounds so delicious. Unfortunately, most Chai Lattes are loaded with calories, mainly from the sugar content. A tall Chai Latte from Starbucks has 200 calories and 32g of sugar, while a skimmed primo Chai latte from Costa has 207 calories. If you buy the full fat massimo size, you’re up for 667 calories – for a cup of tea! There are a few brands of Chai Latte available from the supermarkets, but they generally come in powder form, such as the ‘Drink Me’ range of Chai Lattes. However, they contain a lot of sugar. 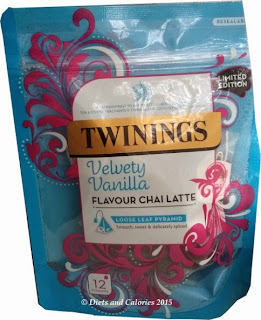 So when I saw this limited edition velvety Vanilla Flavour Chai Latte from Twinings, available in teabag form, I thought this has to be the way to see what Chai Latte tastes like without worrying about calories. re-sealable bag. Inside are 12 loose leaf pyramid teabags. These teabags are so delicate and pretty, it’s almost a shame to drown them in boiling water. 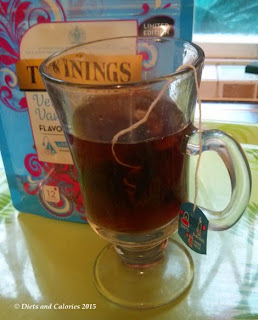 The instructions say you should pop the teabag into a latte glass or mug, then fill about a third full with boiling water, then let it brew for at least 3 minutes. They also suggest topping with hot milk, ‘frothy if possible and a pinch of sugar if you like’. 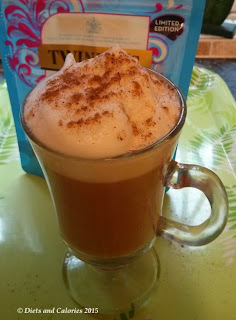 For my first cup I used coconut milk, heating it in the Aeroccino milk frother. Unfortunately, the coconut milk steadfastly refused to froth, so it was just hot milk. This wouldn't affect the taste though. I tried a few sips without sweetening, but didn't like it. 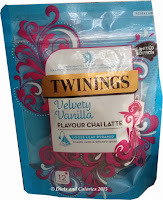 I have a sweet tooth and drink my tea with two stevia sweeteners, so I added these to my tea. Nope, still not keen. The next time I used my regular Alpro Soy Light and frothed it up the same way. After I’d emptied the milk and froth into the cup it looked just like a cappuccino. Mmmm, better. However, I think perhaps this type of tea isn't for me. I like my regular black tea with milk and flavoured teas just aren't my cup of tea (pun intended)! Thinking about it, I may have not put in enough milk. They are supposed to be a milky drink and the instructions say to only use one third water and top up with milk. I've got another 10 tea bags to go through, so I’m hoping they might grow on me. 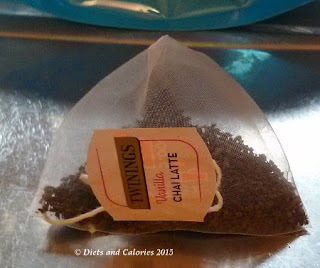 For those who already like spicy teas, I’m sure you’ll appreciate these Chai Latte tea bags. They are a limited edition, but I’m not sure how limited! Purchased in a branch of Sainsbury's. There is no nutritional breakdown on the pack. This is the Aeroccino milk frother. It comes with the Nespresso U coffee machine but you can buy them separately. They produce a really decent, thick foam which is great for cappuccinos.